which allow me to quickly test and debug my web applications. One for my regular browsing sessions, which must be fast, and other two for the development stuff. First of all, lets see how to create a profile in firefox. 1. from the command line, navigate to the firefox folder and run the following command. Viola! instead of your favourite browser, a small dialog will appear. You will see ‘default’ as the profile on the right side, while 3 buttons on the left. Click the ‘Create Profile’ button. Click Next to get rid of the introductory screen (read it if you like), and then name the profile ‘Development’. You can choose a folder of your choice, but its ok if you leave it as is. Firefox takes care of the rest. When you return back to the profile dialog, create one more profile. Name it ‘Testing’. Exit the dialog once you are done. freshly installed firefox interface. Now let’s see how can we get the best out of our profiles. When you are done playing with the multiple firefox profiles, close all of them and start only the “Development” profile. Now let’s customize the interface to save screen space for our development and get rid of extra stuff. 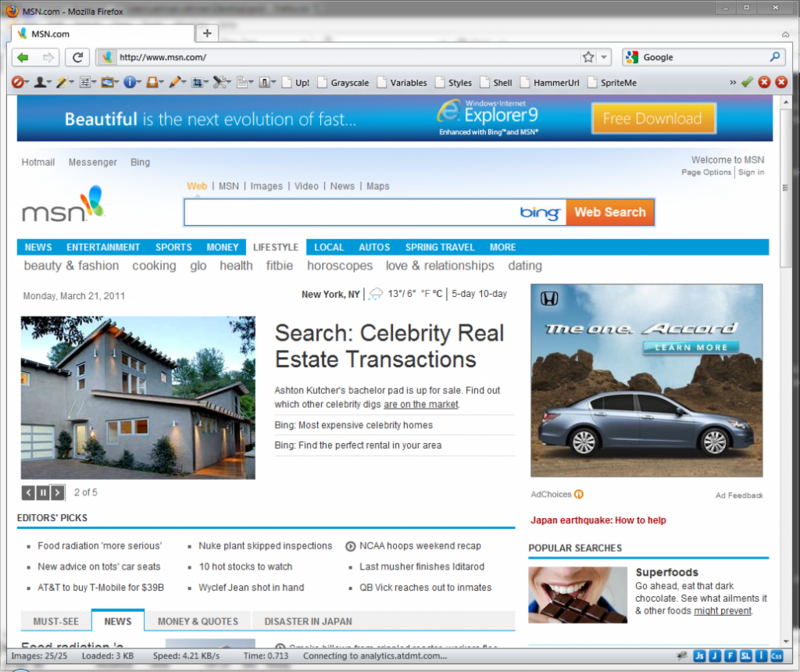 Install the “TwentyTen for firefox” theme for firefox. This is my personal favourite and probably the best theme for firefox. Restart firefox and right click on the toolbar area to hide the bookmarks toolbar. Open Web Developer Toolbar’s option dialog and set to display only icons. This will free up lots of space on the toolbar so we can add some of our own bookmarlet. Open the Web Development bookmarklets site and drag and drop your choice of bookmarklets onto the right side of Web Developer Toolbar. Once you are done, your screen should resemble something like this. Development profile contains required addons and looks pretty neat with TwentyTen theme. Now your super cool web development environment is ready for use. The Testing profile is the one I use after completing the development phase, and when I am ready to analyze and optimize my web applications. Let’s start by installing the required add-ons for Testing profile. Once you restart the browser in Testing profile, you should be able to analyze and fix issues with your web application which are normally not visible during development. While we customized the development profiles, the default profile remains same. This is the one I use for my regular browsing session while I work on the blog, read emails and stuff. I only install the addons most required in the default profile, so that the browser performs at top speed. I hope the above tips will help you in enhancing your browsing habits and improve your development speed. If you have additional addons/tips in this regard, feel free to post them in your comments. Nice article and it is very useful for learners.